One of the advantages of the Treasury Edition format is that it was sturdy enough that it allowed outlets that didn’t typically carry comics to stock them, such as department stores. They were also not quite periodicals, so they’d often remain on sale in these stores for months and years at a time. So it was with this SUPERMAN treasury, which I got in, I think, a JC Penny’s store after having seen it multiple times. It’s a big collection of stories all selected around the theme of the Man of Steel’s interactions with children. 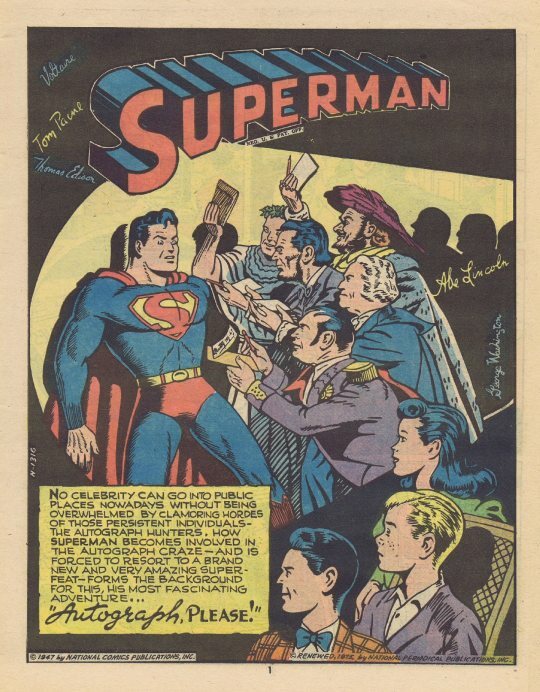 In the opening reprint, produced by the Siegel & Shuster studio (but with their byline removed in these pre-settlement days) Superman breaks the time barrier to help an injured boy win an autograph competition over a spoiled rich kid. It’s tantamount to cheating, but since winning will give the boy the confidence to walk again, Superman goes along with it, collecting signatures through the ages from Washington, Lincoln, the signers of the Declaration of Independence and more. But of course, it’s Superman’s own signature that seals the deal. 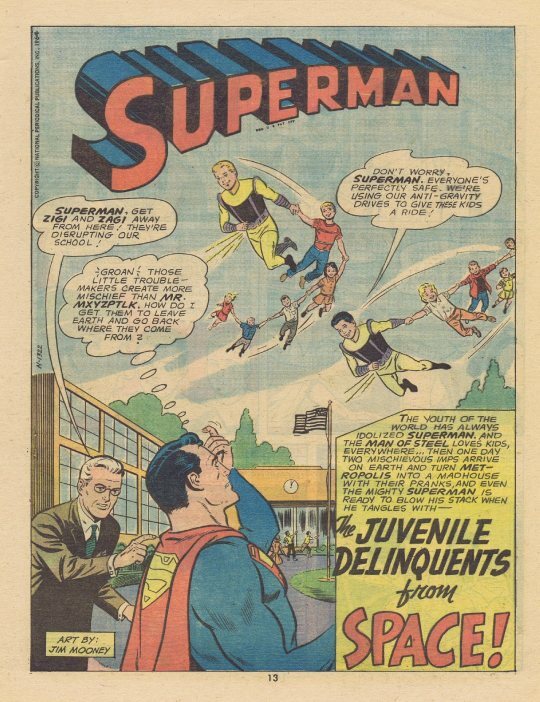 Next up was a two-part story in which Superman was bedeviled by the “Juvenile Delinquents of Space”, Zigi and Zagi from Alpha Centauri. They come to Earth on a joyride and wind up using their advanced super-science to cause mischief for the Man of Steel. Superman unearths their buried ride and convinces them to take off for home–unaware that an escaped killer has stowed away on their ship. Once he discovers what’s happened, the Man of Tomorrow has no choice but to pursue them into space. But the trip causes the killer to knock himself out, and Zigi and Zagi conceal him from Superman in order to keep the Man of Steel on their homeworld. They connive to set him up with their sister Zyra. 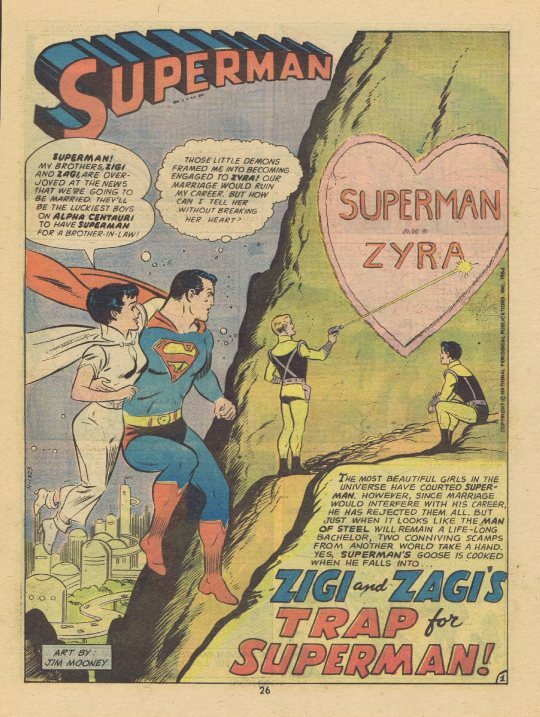 But Zyra secretly loves another, and Superman works to bring them together before heading back home without the killer he’d pursued–only to discover that the two alien kids had earlier shipped him back to the Earth authorities. Next came another offering of the uncredited Siegel & Shuster studio, this one bringing together two of the series recurring pest characters, Mr Mxyztplk the mystical imp and Susie, Lois Lane’s fibbing niece. 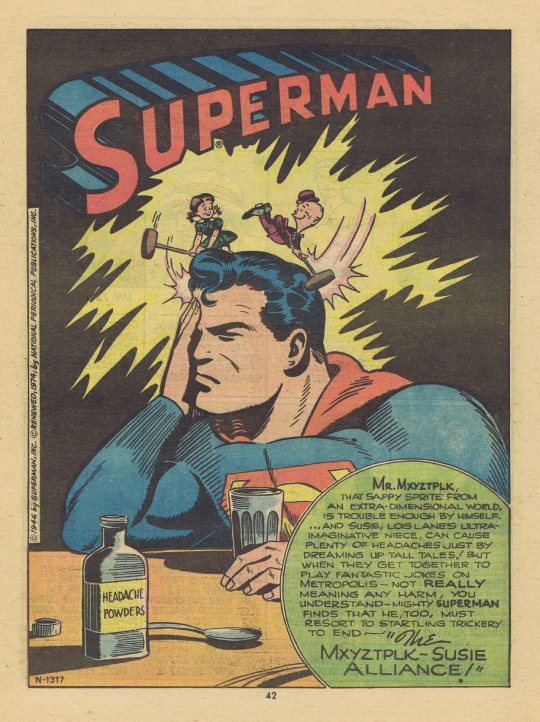 Entranced by Susie’s imagination, Mxyztplk makes all of her wild whoppers come true, much to Superman’s frustration. But eventually, of course, the Man of Steel tricks Mxyztplk into speaking his name backward, and back to the 5th Dimension he goes! The Treasury Editions often contained special features as well as stories. 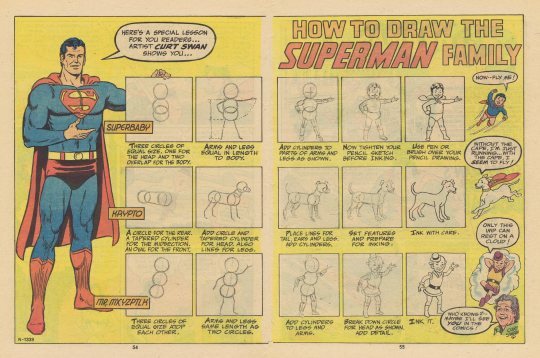 This one contained a brief art lesson by Curt Swan about how to draw different members of the Superman extended cast. It wasn’t in-depth enough for me to get a grasp on the principles involved, but as I was already making my own home-grown comics (mostly knock-offs of books I was reading) this kind of thing fascinated me. 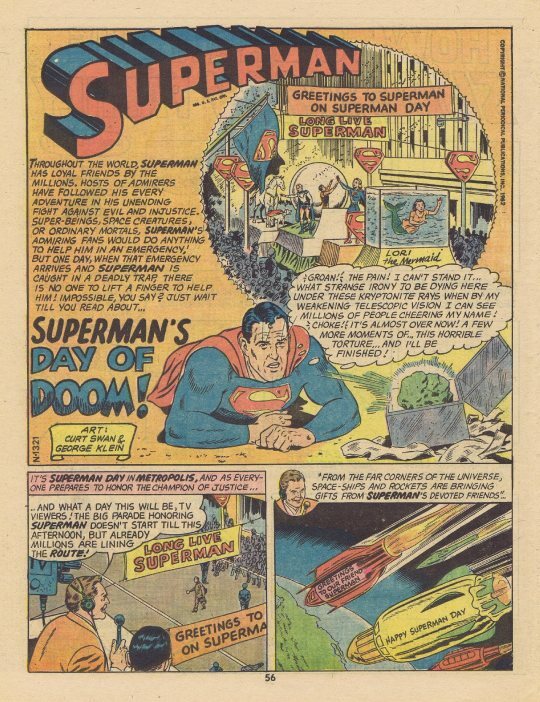 In the final story, the predilection of the Superman stories of this era to pair the Man of Tomorrow up with characters bearing the initials LL is parodied in a way, as a prophecy machine predicts that Superman’s life will be saved today by L.L. As Superman is trapped by Kryptonite and lies dying, the story eliminates one by one all of the assorted LLs in his life. Superman is ultimately saved by Steven Snapinn (no doubt named in tribute to DC letterer Milton Snapinn or perhaps his son) But he counts because he’s wearing his Little League uniform! Don’t tell me that these 1960s Superman stories weren’t serious stuff!